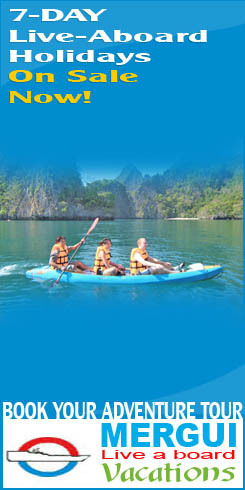 Note Date : All ready-made Tour Program will be operated (minimum 2 pax) on your requested. : Maximum 5 Pax for Vessel Mergui Princess, 6 Pax for Vessel Ayer Princess and 6 Pax for Vessel Victoria Princess. * Remark FS – Fuel Surcharge - additional fuel surcharge depend on the fuel prices with prior notice. Double sleeping Camping Tents & Sleeping Bags with prior request. Children under 12 years old will be charged 75% of a pax. All licensed guide or local staff will be charged 50% on published package rate (for only package trips). Every 5 paying pax, 1 free-of-charge for bonafide tour leader and valid on Ayer princess only. Note: On Mergui Princess we will still provide 1 free of charge but sleeping place limited to tent on the deck or captain’s house. A deposit of 30% of the total cost per person is required within one week to secure the trip. The balance need to be paid at least 30 days prior to the departure date. If full payment has not been receive, TMC Limited (the management company of Mergui Princess) reserve the right to cancel the booking. Bookings made within 30 days of the departure date must be paid in full at the time of the booking. All the prices are based on the cost and exchange rates at the time of printing and we reserve the right to adjust the tour prices. One month prior to the departure date full refund minus permission fees USD 80 per person or Bank transfer fees if there is any. We recommend to advise your clients to buy medical evacuation insurance which provides for helicopter rescue on their own before starting the trip. The purpose of insurance is to provide proper coverage suited to the specific needs of Adventure Travel and in the case of an emergency case, works quickly and efficiently. The insurance should also cover accidents, health and loss or damage to the personal effects. We can take no responsibility for scheduling or itinerary changes due to changing weather, political situations,natural disasters or other events beyond our control. All payment should be made in cash (US Dollar Only), Bank Transfer or Credit Card (Visa, Master, American Express).